Ruby Wilson fills out a job application during the 2018 SVCC Spring Job Fair. 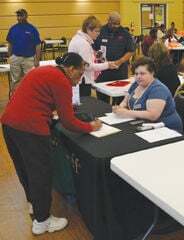 SVCC Workforce Development Director Courtney Starke coordinated the previous regional job fair at the site in November and said that experience has made getting ready for Wednesday run a little smoother. The regional job fairs at the Southside Virginia Education Center began on a bi-annual schedule in the fall of 2014. Those seeking employment are urged to bring plenty of resumes and a photo ID. Those with a WorkKeys Readiness Certificate will be allowed to enter the job fair at 12:45 p.m.